As your children count down to their well-earned break from school, it can be a difficult time for parents – particularly if you’re bringing up children alone. All parents can find themselves facing complicated childcare arrangements, financial pressures and trying to keep bored children occupied but, for single parents, these issues are often magnified. Disagreements about where the children will spend time can flare up, reminding everyone that family life has changed and this can be a painful process. A quarter of British families are now single parent families with 1.8 million mothers and fathers raising their children alone. At Family Lives we hear from thousands of lone parents each year and we have put together the following tips, for parents by parents to help take the pressure off the school holidays. Make a list of all the school holiday dates and how much childcare is needed so that your ex and extended family can understand the situation, especially if you are also juggling work and annual leave. Include childcare scheme costs so that all parties can come to some negotiation. Seeing the situation from each other's perspective can help relieve any hostilities that might be brewing. If you have negotiated a plan for the year or a period of time add the dates to a calendar for your children. If children feel they have contributed to the plan or know where they will be at a particular time, they will hopefully feel more at ease during the transition stages from one home to the other. Spread days together out over the school holidays so both parents have a chance to spend quality time with children. If you are thinking about taking your children away on holiday on your own, there are holiday companies who specialise in this, so check out the web or travel companies and read more about travelling abroad as a single parent. Single parents whose ex-partners have no involvement in the children’s lives, could consider striking a deal with friends in the holidays to take turns looking after each other’s children. It is natural for children to feel hurt and angry about this and they will need lots of reassurance that you will always be there for them. You will also need to be patient with them as this anger may boil over from time to time. Involve older children in the decision-making whenever possible. You may need to try and work out ground rules with your ex over the bigger issues such as leaving older children unattended. If you can talk to your ex try to keep them up to date on issues your teenager might not disclose such as exam revision so they can encourage them to study when they come to stay. Be prepared to review and change arrangements and to discuss these with your children as they grow older. Younger children may need frequent short visits, whereas teenagers may prefer to spend weekends with friends but have regular email or telephone contact and holidays with the non-resident parent. Look out for any changes in your child. If you notice they more moody or withdrawn than usual, it may be due to the changes going on around them. Find a quiet time and ask them how they are. Tell them you know things are different and strange. Allowing them to be part of decision-making may help with these feelings. If plans need to be changed remember to consult your ex, especially before booking anything. If both parties make an effort to be considerate it will make a big difference to the children. Don’t use contact or time together as a bargaining ploy. You may no longer be partners but you are forever parents, and your children need you to co-parent even if you no longer live together. Try to be as fair as you can with your ex-partner and remember that your children’s school holidays may clash with that of step or half siblings. If you or your ex wants to take the kids on holiday you may feel anxious, especially if the plan is to go abroad. 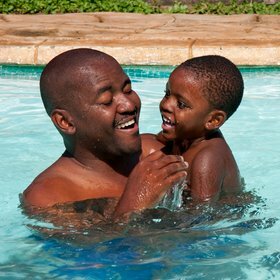 Clear communication such as sharing information, itineraries, contact details and things such as how well your children can swim or what factor suncream they will need, will help put both parents at ease. Try to keep in touch whilst on holiday even if it’s a quick phone call or text. You may feel resentful and hurt about your child spending time with the other parent, particularly at first but share those feelings with another adult, not your child. Children can pick up on our feelings and can be torn between parents, feel guilty and confused and may react by avoiding one parent or lashing out at the other. When your children do go off with your ex, you may feel a mixture of emotions from loneliness to relief. It's ok to feel relieved – it’s tough bringing up children alone and you deserve a break. When the children go, your home will seem exceptionally quiet so try to make the most of the time by catching up with friends or doing something for yourself. Where possible, it is good for children to have continuing contact with grandparents, aunts and uncles from both sides of their birth family, for the stability they offer and the continuing link with their own origins. Keeping in touch can also offer practical help as they can help with child care. Some holidays will have greater significance than others such as festivals, birthdays or special days. Children could spend the main festival day, a particular school holiday or birthday at one home one year and at the other parent's house the next year. Or, sometimes, children can have more than one Easter or Passover, Diwali or Eid over a holiday period, they will love it. Read more about coping with festive holidays.